It seems that I'm not the only car guy impressed with the new Ram 1500. 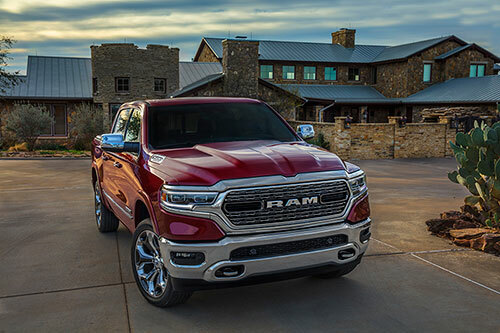 It was also named as North American Truck of the Year at last month's big car show in Detroit, it made Car & Driver magazine's list of the 10 Best Trucks and SUV's, and the Rebel version was named Four Wheeler magazine's Pickup Truck of the Year. I probably missed a few, and it wouldn't surprise me if more honours are coming for this great truck. And yes, you can have a hemi. That hemi is a 5.7 litre V8 that also features "FuelSaver MDS", which deactivates some of the engine's cylinders when they aren't needed to provide optimal oomph. That undoubtedly helps the Ram 1500 reach a fuel mileage estimate of 10.3L/100 KM (27 mpg) on the highway and 14.1L/100 KM (20 mpg) in the city. Obviously, this isn't Prius-type mileage, but it seems pretty good for a truck that's big and strong enough to tow my house off its foundation. Power comes on beautifully, and with a lovely V8 burble. Ram says the Hemi cranks out 395 horsepower and 410 lb.-ft. of torque, and though I didn't haul or tow anything during my week with the Ram, it certainly does seem capable. An eTorque feature combines a belt-drive motor generator unit with 48-volt battery pack to enable engine start/stop functionality, short-term torque assist and brake energy regeneration. It adds up to "up to" 130 lb.-ft. to the 5.7-liter HEMI V-8's output. Power gets to the road through an eight-speed automatic transmission that works very well. The independent front suspension features new components that blend lightweight composite upper control arms, aluminum lower control arms and a retuned geometry, and the front stabilizer bar has been relocated behind the front tires, which the company says improves roll stiffness by 20 percent (I didn't roll the Ram, so can't comment on that aspect; guess I should've!). The Ram also gets "all-new Frequency Response Damping (FRD) shocks" to "deliver the best combination of ride, handling and comfort in a pickup" while its "next generation, class-exclusive air suspension enhances fuel efficiency, improves ride, and gives greater off-road capability, load-leveling and entry/exit convenience." Can't argue that; this is the most un-truck-like big truck I've ever driven. The rear end features Ram's third generation, exclusive rear five-link coil suspension, which really helps the truck drive in a less "truck-like" manner. So, there's a lot less shudder and sliding over frost heaves and the like, which is a wonderful thing to feel in a truck. The company claims the Ram 1500 earns best in class towing rating for a V8, as well as hauling the most payload of any Ram. Towing capacity is 12,750 lb (5,783 kg), and you can put up to 2,300 lb (1,043 kg) in the bed. Ram's sample had a tonneau cover over the bed, which might make putting that 2,300 pounds into it a tad challenging, but I'm sure truck folks will figure it out. The folks behind the truck say they've done a lot of things to make this Ram the best yet, including putting it in the gym to reduce its weight by nearly 225 pounds compared to the last one. Its new frame features "98 percent high-strength steel to improve durability, weight and rigidity for improved handling" (and I was gobsmacked by how well this big vehicle handled curves, U-turns, etc. ), and tweaked its exterior with stuff like a new grille that looks aggressive (but quite handsome) as well as exclusive active aerodynamics including grille shutters, air dam and air suspension. That stuff combines to give the Ram a .357 coefficient of drag. Not only does this beast drive very well, it (at least the Limited version does) also comes with an excellent interior with the biggest – and one of the most well thought out – central LCD screens I've used in any vehicle. It seems about as big (or bigger) than a standard iPad and the folks at Ram really sweated the interface to come up with something efficient, attractive, and easy to use. The 12-inch "reconfigurable" touchscreen features split-screen capability for "dual-application operation," which means you can multitask with it – for example, you can have the audio controls on top with the HVAC info below (or however you want to set it). I loved it! I had some minor issues figuring it out initially, but owners should get up to speed with it a lot more quickly than they might with some competitors' products, and I'm not just talking about trucks. Indeed, I can think of a few carmakers who could benefit from stealing, er adapting, this interface for their mainstream vehicles. And there's plenty more, too much to mention in a single column. Naturally, you also get today's aides and nannies, stuff like park assist, blind spot warning and a rear-view camera with rear cross traffic alert (pretty well the only such nannies I can stand in a world of lane keeping assist, adaptive cruise control, etc. – which the Ram offers as well). The downside to all this truck goodness is its sticker price. The Ram 1500 Limited CREW CAB 4X4 tips the fiscal scale at $74,195 CAD, and that's without options. The sample also came with Diamond Black Crystal Pearl paint ($275), four adjustable cargo tie–down hooks ($100), Limited Level 1 Equipment Group ($3,895 – includes, among other things, the 12–inch touchscreen, Harman/Kardon 19-speaker audio, Adaptive Cruise Control with Stop, Advanced Brake Assist, Auto high–beam headlamp control, Forward Collision Warn/Active Braking, Lane Departure Warn/Lane Keep Assist, Parallel/Perpendicular Park Assist, Surround View Camera System, Uconnect 4C NAV with 12–in display, Rear ventilated seats). And that isn't it! The sample Ram also had stuff like the soft tri-fold tonneau cover ($650), an anti–spin differential rear axle ($525), active noise control system, , a power dual-pane panoramic sunroof ($1,595), 124-litre (27.4–gallon) fuel tank ($445), 22 x 9 inch polished wheels with painted inserts ($750), a Class IV hitch receiver ($495) and Electronic Trailer Brake Controller ($375). That's a lot of stuff, some of which most people may or may not be able to live without, but it adds up to a heckuva great truck for those whose budgets reach the $80,000 level and above. If that's you, you should march (or at least February) right down to your Ram store and try one of these suckers out. After all, it's a truck recommended by at least one guy who wouldn't buy a truck if it were the last vehicle on earth! I'm not sure how credible a recommendation that is, but there it is anyway. And if you can't afford 80 grand, you can get into a Ram 1500 for about $35,000. You won't get all the toys, but you'll still get a truck that drives better than it has any right to. You'll have to eschew the Hemi in favour of the alternate 3.6 litre Pentastar VVT V6 engine with eTorque, but such is life. Besides, that Hemi's only an extra $1900!